Hack 'N' Slash is not a hack-and-slash. "In Hack 'N' Slash, a young elf uses her computer hacking skills to cheat her way through a classic action/adventure game. By subverting old-school gaming tropes with unique hacking mechanics, Hack 'N' Slash allows non-programmer players to experience that same sense of mystery and discovery." If this intrigues you, you may want to head over to the Hack 'N' Slash website and download the massive .JPG file. "Why is it so massive?" you ask. Well, you'll just have to figure that one out for yourself. It is a game about hacking, after all. Project Lead Brandon Dillon says he based the game on his childhood experiences hacking games in emulators to "discover new things (and break others)." He says the game comprises of a world of puzzle dungeons based on progressively more sophisticated cheating, hacking, and reverse engineering techniques. "Instead of a sword, you get a laptop, searching for and building software to help you dismantle and rebuild the world around you." Fans are still trying to pull more content out of the cryptic website, so stay tuned for more info on that. 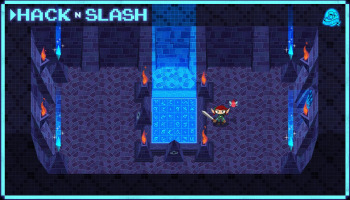 Hack 'N' Slash will release sometime during the first half of 2014.